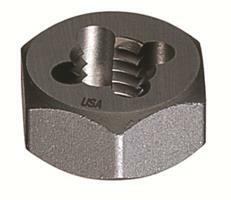 Application: High speed steel special "8 thread" series hexagon rethreading dies are for use with any open end, box or adjustable wrench. Chamfered on both sides, double the life of the single chamfer style. Often referred to as thread chasers. For dressing over bruised or rusty threads.